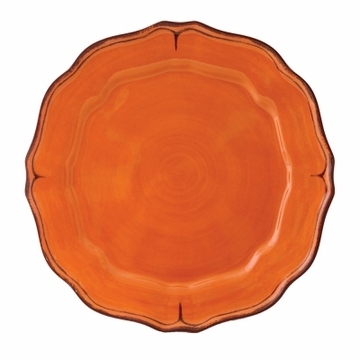 The Le Cadeaux Basque Tangerine dinnerware has a beautiful, rich pigmentation that calls to mind rustic terra cotta, but it's actually melamine that is triple the weight of other brands. This dinnerware is nearly unbreakable, making it the perfect choice for outdoor entertaining. Le Cadeaux Basque Tangerine dinnerware is a beautiful solid that coordinates with many other Le Cadeaux patterns, or it can be used for a bold monochromatic look. Mix and match pieces for a layered effect, and don't forget to add Le Cadeaux polycarbonate drinkware to complete the look. All Le Cadeaux tableware is free of BPA, lead, and cadmium. Le Cadeaux melamine dinnerware is dishwasher safe, too, although we recommend that you not use these dishes in microwave ovens.